3787, USED RIM, 20X8-1/2, 6 LUG, 135MM, 09-11, FORD, F150, ALUM, 6 RAISED SPOKE, BRIGHT MACHINED. 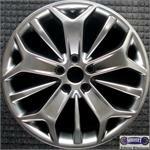 6614, Used Rims, 15X6, 4 LUG, 100mm, 06-08, CHEVY, AVEO, OPT PG9, 5 SPOKE, SILVER, ALLOY. 68146a, Used Rims, 15X5-1/2, 4 LUG, 114MM, 85-87, SAAB, 900, SILVER, STEEL 16 HOLE. 69224, Used Rims, 15X5-1/2, 5 LUG, 100MM, 88-91, TOYOTA, CAMRY, LEXUS, ES250, STEEL, 15 SPOKE, COMES BLACK OR DARK GRAY.